This edition of the EcoSur e-Magazine is devoted to the reconstruction actions in Haiti. EcoSur has sent a group of expert to evaluate the needs of reconstruction in Haiti, specially in the small towns off the capital city. EcoMaterials and their related technologies are getting mentions and becomes very popular thorugh all the continent. The EcoSur office in Nicaragua received the visit from the Pedaling South Expedition. They are cycling 25 000 km across the Americas from Alaska to Argentina to raise funds for Cyclo Nord Sud, a non-profit that sends used bicycles to developing countries. As ambassadors for this organization, the Pedaling South Expedition will meet with Cyclo Nord Sud’s Latin American partners and hopefully create contacts with new ones along the way. This ride is something concrete to do to help promote sustainable transportation and international cooperation while celebrating our passion for cycling and adventure. 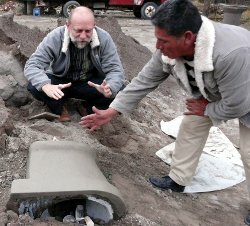 The EcoSur Network plans to bring the Otji-Toilet to the Caribbean. In Haiti, where the infrastructure is weak not only from the great earthquake in January of this year, the Otji-Toilet should definitively contribute toward improving hygienic conditions. The climatic conditions of that Caribbean country appear to be appropriate for the the dry toilet developed in Namibia. 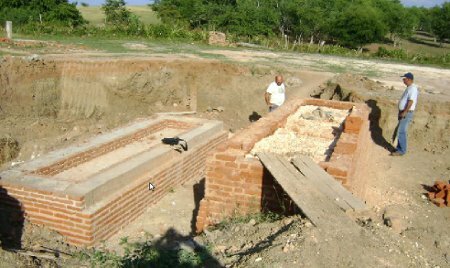 Thus, EcoSur together with its European partners will install a workshop to produce Otji-toilets. Not only will the project bring dignified and environmentally friendly sanitary installations, it will install a workshop to produce toilets in the town of Liancourt and educate young people to build the toilets. 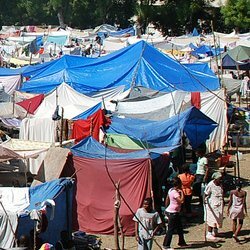 Thus, it will provide opportunities and future perspectives outside the capital city of Port-au-Prince, hoping to avoid the return of earthquake refugees to the larger urban area. In the near future Peter Arndt, manager of the Clay House Project in Otjiwarongo, will travel to Haiti to introduce this technology, hitherto unknown in that region. To educate the group of 20 youths, he can draw upon the support from EcoSur specialists from Nicaragua, Cuba and Switzerland, some of whom will remain onsite and be able to support the project with advice and assistance. It is worth mentioning that the Clay House Project in Otjiwarongo is an EcoSur Network partner and that Peter Arndt is the creative and driving force behind development of this dry toilet. The project "EcoMaterials in Social Housing Projects", developed by CIDEM in Cuba, partner of the EcoSur Network, was presented between the 25 Best Practices from 23 countries around the world, are part of the Urban Best Practices collective exhibition organized for the Fifth World Urban Forum in Rio de Janeiro, Brazil. The sample includes a set of initiatives that have been classified as winners or best practices for organizactions fo Dubai International Award and the World Habitat Award. The practices from past Dubain International Award submissions were selected by BLP partners,with the overall coordination of UN-HABITAT Best Practices Programme, Best Practices Hub Viena and Fundación Hábitat Colombia. The Building and Social Housing Foundation (BSHF), provided a sample of their World Habitat Awards. The graphical displays are complemented by the publication of reviews of each practice, a video and a Web page for electronic disseminatio. CNN reports about the actions of the EcoSur partner in Cuba, CIDEM and its work in the reconstructiona after the Hurricane Gustav that hit the island in August 2008. Havana, Cuba (CNN) -- "We never imagined having a house like this," says Eric Martinez as he walks through the three small bedrooms with their flowered quilts and family pictures. The walls are freshly painted and pink curtains hang in the windows. "When the hurricane came through it left nothing, nothing at all," he says. "It wasn't just one house that was destroyed, it was a bunch." Hurricane Gustav slammed into the Cuban coastal town of Los Palacios in August, 2008, a dangerous category 4 storm. It damaged 84 percent of the homes, many of them made of wood. Ten days later, Hurricane Ike tore across much of Cuba, dumping torrential rains on Los Palacios. And then in November, Paloma struck the island. The government put the combined damage at $10 billion. Now, a unique program helps victims like Martinez re-build their lives -- and their homes. 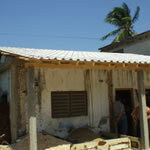 CIDEM, partner of the EcoSur Network in Cuba, begun the construction of two VSBK for fired clay bricks in the cities of Holguín and Bayamo, at the east of the island. The VSBK is one of the most efficient kilns, only exceeded by large industrial Hoffman type or tunnel kilns. 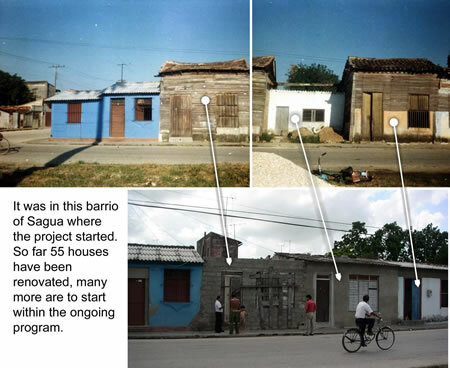 In Octuber 2009, a mision of Cuban experts were in Ecuador where they meet the VSBK built in Chambo, province of Chimborazo. With these newly acquired skills, and after a visit to Cuba of Estuardo Quispillo, ecuadorian expert of the EcoSur Network Ecuador in November 2009, the construction of these two VSBK in Cuba started. It is expected that in July 2010 the kilns will be fully operational. The devastating earthquake in Haiti early in 2010, tragically emphasized the vital importance of empirical and social research into the development and application of appropriate, sustainable and affordable building materials - the theme of the Ecomaterials 4 Conference held in Bayamo, Cuba, November 22-24, 2009. Experience shows that it is extremely difficult to move fast from an emergency situation to reconstruction. The situation of living in a shelter that does not provide security for life and goods prevents people from going about their normal activities, including going to work and earning an income. Temporary installations should not just provide shelter from the climate, but also security and a reasonable degree of privacy. Peter Arndt, the "inventor" of the dry toilet, developed a new type of toilet bowl that can separate the liquids from the solids. In laboratory tests, the bowl can separate up to the 75% fo the liquids that are aimed to the walls. This new bowl design, plus the already known eficiency of the dry toilet, allows the liquids to get dried and compacted faster. In this second version of the dry toilet, the design has been simplified in a way that could be possible to remove the plastic tanks in the bottom of the pit, and maintenance will be reduced to a minimum. From Peru, Ramon Barua Costa, general manager of Fosfatos del Pacífico, Cesar Arias, project engineer and Luis Garcia Baux, comercial manager of Distribuidora Norte Pacasmayo, visited the Vertical Shaft Brick Kiln (VSBK) in Chambo, Ecuador. The Peruvian company Cementos Pacasmayo (web site) and its subsidiary Fosfatos del Pacífico have made a project about a brick factory in Piura, northern Peru, to promote the sustainable economic development and to facilitate the access to market opportunities and promoting the local understanding as a way to grow and to realize productive projects that benefits the communities. 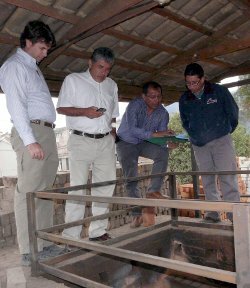 The peruvian visitors were gladly impressed by the efficiency and productivity of the Kiln, as well as by the construction method and the organization of the artisanal brick producers around. 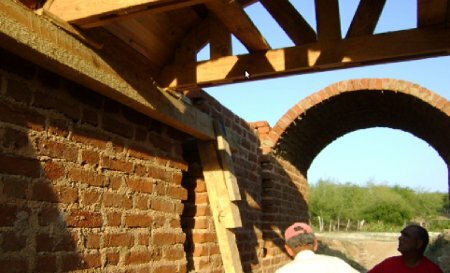 EcoSur will provide in a near future technical assistance and training for the construction of one Vertical Shaft Brick Kiln in the area of Piura. What will DESWOS do to support the rebuilding? Together with our partner organization, the EcoSouth Network, with a base in the neighboring Dominican Republic, we will focus the reconstruction aid for Haiti in the urban outskirts and rural areas. In these regions, after such catastrophes support often arrives only too late and is too little...."